Old Hollywood Films is partnering with Flicker Alley to give away one Blu-ray/DVD copy of the newly restored World War I classic, Behind the Door (1919). April 6, 1917, marks the 100th anniversary of the U.S. entry into World War I, That momentous event forever changed the course of the 20th century and led to the creation of several iconic films. With that in mind, the dedicated film preservationists at Flicker Alley are releasing a powerful drama about prejudice and patriotism that hasn't been widely available for several decades. 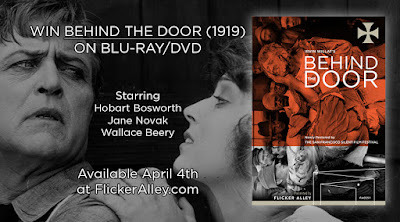 Old Hollywood Films is proud to be partnering with Flicker Alley and several other amazing sites for classic and silent film fans to host a giveaway of Behind the Door (1919) on dual-format edition Blu-ray/DVD. Legendary producer Thomas H. Ince and director Irvin V. Willat made this—“the most outspoken of all the vengeance films” according to film historian Kevin Brownlow—during the period of World War I‑inspired American patriotism. Hobart Bosworth stars as Oscar Krug, a working-class American, who is persecuted for his German ancestry after war is declared. Driven by patriotism, Krug enlists and goes to sea. However, tragedy strikes when his wife (Jane Novak) sneaks aboard his ship and is captured following a German U‑boat attack. Krug’s single‑minded quest for vengeance against the sadistic German submarine commander (played with villainous fervor by Wallace Beery) leads to the film’s shocking and brutal climax. 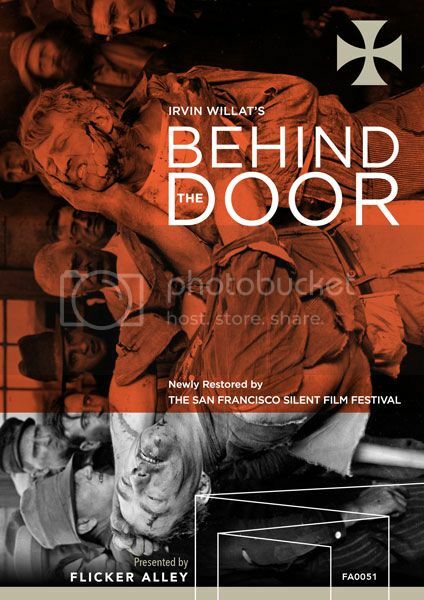 Original Russian version of Behind the Door: The re-edited and re-titled version of the film that was distributed in Russia, with musical accompaniment by Stephen Horne. Original Production Outtakes: Featuring music composed and performed by Stephen Horne. Restoring Irvin Willat’s Behind the Door: An inside look at the restoration process with the restoration team. Kevin Brownlow, Remembering Irvin Willat: Directed by Patrick Stanbury, an in-depth interview with renowned historian and honorary Academy Award® winner Kevin Brownlow on the career of director Irvin Willat. Slideshow Gallery: Original lobby cards, production stills, and promotional material. 12-page Booklet: Featuring rare photographs and essays by film historian Jay Weissburg, film restorer Robert Byrne, and composer Stephen Horne. Official Release Date: April 4, 2017: Pre-order now at the special sale price of $29.95 for a limited time. To enter just fill out the form below and leave a comment on your favorite World War I movie. Examples include All Quiet on the Western Front (1930); Sergeant York (1941); The African Queen (1951); Lawrence of Arabia (1962); The Fighting 69th (1940), and Paths of Glory (1957). As a talkie, I love "The Fighting 69th" ( I just love Cagnes & his group). In silent, I am a big fan of "The Big Parade" and "Hearts of the World"( great opportunity to see Dorothy Gish let loose). La Grande Illusion (1937)/ Hell's Angels (1930)/ The African Queen (1951)/A Farewell to Arms (1932)/Wings (1927) ~I'm so bad at trying to narrow it down to one film! I'm pretty excited for this!